This set of instructions on how to make a Box kite assumes you know absolutely nothing about kite making. You might already have some of the simple tools and materials required. Anything you don't have is easily bought. If not exactly what I used, then at least something pretty similar! 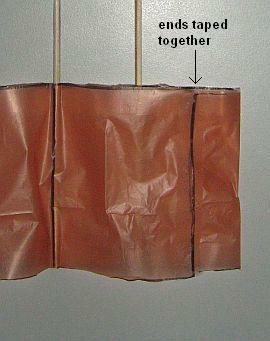 The instructions on how to make a Box kite might look quite long, but each step is simple to do. Just quickly work your way through, skimming over any detail that you don't need. All in all, it should be quite hard to make a mistake! 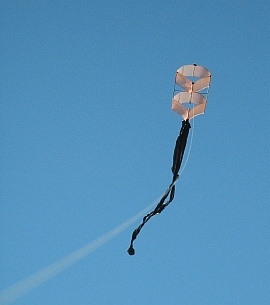 The MBK 1-Skewer Box Kite is rather small at just 29cm (11 1/2") long, with cell panels measuring 14.5cm x 8.7cm (5 3/4" x 3 1/2"). It will stay airborne in moderate winds, but does even better in fresh winds. Like all the other MBK 1-Skewer kites, this design can't be taken apart for transport. However, that's not much of a problem due to it's small size! Just be sure to treat it with care when handling or transporting it. Select 4 bamboo BBQ skewers that seem fairly straight. Check this by rolling them across a table top, one by one. Or just look down their length. In addition, try to ensure that 2 of those skewers have very similar flexibility. Either bend them by hand to try and judge this, or get a little more ingenious by suspending the ends and putting a weight in the middle... Getting this right will help the finished kite to fly straight without needing too much tail. Put a mark on these 2 skewers so you know which ones they are. They are the top 2 spars in the photo. Snip the point off one skewer, then measure it to establish '1 skewer length' (1.0SL) for your kite. For me, this was 29 c.m. Take another 2 skewers, and snip one of them to exactly 0.7SL (20.3cm, 8") in length. Make the other one just 0.5cm (1/4") longer. These are the 'cross pieces'. The longer one will be trimmed to fit, later. Firstly, take a light, single-ply plastic bag and lay it flat on the table. I use cheap orange garden-bags. The more expensive bags are usually 2 or 3-ply plastic, which is heavier and less see-through. Near one edge of the bag, measure and mark a rectangular outline according to the Template. Use a black marking pen and ruler. Now measure and mark the fold lines. See the photo. Flip the bag over, and trace over all the black lines. Use the ruler, of course! Cut the bag down one side and open it out. Cut around the 2 rectangular outlines with scissors. I don't recommend trying to do both rectangles at once, since the plastic tends to slip! 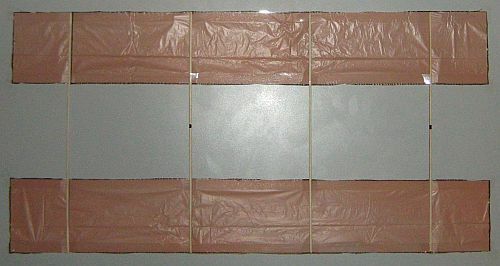 Arrange the 4 bamboo spars over the plastic as in the photo, covering up the drawn fold-lines. Make sure the marked side-spars are positioned as shown in the photo! Lay down 4 long lengths of clear sticky tape, securing the spars to the plastic. The tape is just visible in the photo - look for where the plastic is smoother and slightly darker, near the edges. Each tape goes all the way from left to right, over the 4 spars. Remove everything from the table top, either pulling off or trimming away the small square bits of tape at the corners. Fold the sails, bringing the short edges together and sticking them with tape. The photo gets close-up on one of the 2 joins. Now open the box kite out, and carefully lay down tape along the inside edges as well, to make the 2 joins even more secure. A bit tricky, take your time!